First in a series of fine and tastefully balanced arrangements by Raymond Burley, featuring some of the pearls from the Spanish repertoire. 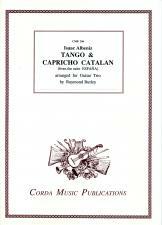 TANGO AND CAPRICHO CATALAN (from Suite Espana) by Albeniz, arranged for three guitars by Raymond Burley. Here are two very popular Albeniz piano pieces arranged for three guitars, with parts of roughly equal difficulty. The fun here is that both pieces are gorgeous examples of Albeniz at his compositional best and they transfer very well to three guitars. Both works have been arranged before for all sorts of guitar combinations, including solo guitar, but spreading the music onto three instruments does make it much easier. The 'Tango' is a particularly good example of a piece that uses both triplets and dotted rhythms. At least in this arrangement you get the chance to fully separate the two rhythms without the complex finger-work sometimes involved. Of course it all sounds very apt, as Albeniz always does on guitar. The 'Capricho Catalan' is a touch easier still to get your fingers around and is such a marvellous melody that is destined to win over the hardest of hearts. At least it can be played now at its correct speed of Allegretto, for what often happens with this piece is that it is slowed down to Andante to accommodate all the exotic chords. Split up onto three instruments, this does alleviate the problem somewhat. There you have it, two familiar pieces of medium difficulty arranged for three guitars. There is plenty of fun to be had from this engaging material.